For a thorough understanding of the aerodynamic properties of aircraft, high fidelity viscous simulations are necessary to complement wind tunnel investigations. RotCFD, a CFD code developed by Sukra Helitek, Inc., offers a design tool that allows the user to manipulate the geometry, generate body-fitted viscous grids, run the flow solver and visualize results, all combined in an easy-to-use, seamless Integrated Design Environment (IDE). RotCFD is widely accepted in the rotor-craft industry as an effective design tool that can carry out aerodynamic simulations economically before model scale testing is considered, thereby saving cost and time and permitting a larger design space than is otherwise possible. A CAD-like pre-processing tool for parametric variation and manipulation of geometry. A semi-automatic grid generator, with body-fitted tetrahedral grid near the body and cartesian unstructured grid in the farfield. A fast and efficient discrete blade unsteady rotor model with maneuvering capabilities, along with rotor trim calculations. Compatible with Linux,Windows and Mac operating systems. Flow visualization along with rotor performance, trim and body force calculations. 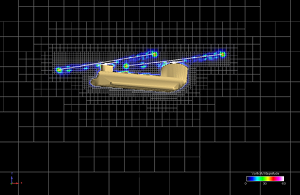 RANS-based, high accuracy general purpose unstructured flow solver, capable of solving laminar as well as turbulent flows.